Written by Brenda on September 3, 2014 How to sell online. If you listen regularly to popular podcasts, you may have heard a host read out a coupon code from one of their sponsors. That’s because, as you probably know, the sponsor’s done some market research and figured out that their demographic tends to listen to these shows in large numbers, and are open to hearing about a discount on something they’re already likely to buy. This approach can theoretically be used in any form of media, but it’s most effectively used with time-sensitive ones. After all, you want that coupon to expire eventually. If you’re considering an approach like this, but worried that you won’t get your money’s worth, you can offer the host sales commissions. This can provide an incentive to someone who may be reluctant to put any enthusiasm into their pitch. They can also be used to foster partnerships. With The Marsupial Method, entrepreneur Daniel DiPiazza laid out a plan for startups to “hitch their wagons” to larger businesses that sell different products to the same audience. For example, if you sell boat parts, you can partner with a website that sells fishing rods to increase both your sales. Coupon codes can be an excellent way to get their customers to become yours – much better than ads alone. Maybe you can arrange a deal where customers who buy a certain popular rod will get 15% off a replacement propeller. Or something like that. That way, you’re encouraging both repeat business and personal recommendations. The only downside to this is that it doesn’t really target people interested in buying your product, just people who happen to be friends of those who are. It’s not so direct and might require more persistence to see any results. Still, it’s a worthwhile endeavor, especially if you’ve been looking for a way to get more engaged on social media, too. Remember my article on cart abandonment, where I told you that offering a discount to a cart abandoner can convince them to come back? Well, I’m offering that advice again here in case you needed a reminder. Sending out coupon codes with your remarketing emails can bump up the chance that someone will change their mind and decide to buy your product. As I mentioned previously, you don’t want to just fire them out indiscriminately. A well-placed discount code, preferably one advertised in the subject line of the email, can help bring a customer back to your site and convert. People like deals. Hit them in their inbox with one and you’re bound to see an uptick in sales. Using different coupon codes for each sales channel and marketing campaign you do can be one of the easiest, most analytic-free methods of determining which ones work and which ones don’t. If ten people put in the unique coupon code they got from one source, and fifty people put in the unique code they got from another, you now know more about which referral method works better. That also tells you which referrals you should keep and which you should toss. For any number of things. For example, some sites promise a discount to anyone who subscribes to the company newsletter or signs up for some sort of premium service. Some companies use coupons as birthday gifts, which motivates customers to give you their age. It’s always nice to build a list of your repeat customers and send them coupon codes on holidays, too. And often, you don’t really need a reason. Feel free to give coupons away randomly, so that people will be more likely to wait for your next promotion instead of going to a competitor. Try sending them to customers who haven’t bought anything in a while, too. A gentle nudge back in may prevent them from permanently lapsing. And, of course, we all hope it doesn’t come to this, but coupons can be offered along with apologies to customers who complain about a bad experience with your business. Coupons, both paper and digital, have expiration dates for a reason. It’s so customers will be motivated to get into your store and get what they want now, instead of waiting until it’s slipped their mind. That’s also why “This Weekend Only” sales can light a fire under potential buyers who may be still on the fence, letting them know that if they want an excellent deal, they need to get to your shop posthaste. On a related note, coupon codes given to customers on sale confirmation screens can encourage repeat buys, especially impulse-based ones. In order to prevent “coupon poaching” – unauthorized sharing of your codes – you need to make sure to implement it right. It’s been proven that referring to coupons as “gift certificates” instead of coupons reduces poaching by 90%. Why? Because gift-certificates are paid for in advance. When people hear the term “gift certificate,” they assume that they’re the only person allowed to use it. However, if you do use this approach, don’t tell anyone. We can’t have word about this get out, now can we? Simply not offering site-wide discounts can cut back the likelihood that a particular customer will pinch your code, because it proportionally reduces the likelihood that the code will be for anything they want. So if you can think of a specific item you want to push, this is a way to do it. Finally, the simplest solution is often the best one: set the expiration date sooner. If your coupon’s valid for less than a week – or even as short a period as a weekend – it probably won’t be worth the potential pirate’s effort to share it, since it will have expired by the time everyone else gets around to using it. 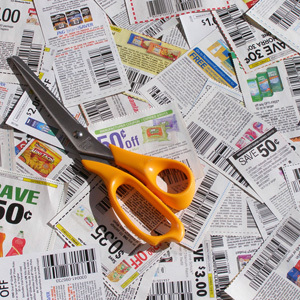 The effective use of coupons can do wonders for your business’s reputation and customer loyalty. And if you take steps to control pirating, it doesn’t even have to be at the expense of money in lost sales to strangers. Any other coupon-giving tips you’d like to share? Feedback about how these methods have worked for you? Please let me know in the comments. Howdy! Have you thought about the Forsen Amazing Internet Money System (Have a quick look on google can’t remember the place now)? I’ve heard some interesting feedback about it and my GF got amazing results with it.